I planted shallots in the fall and covered with six inches of straw. When I uncovered them this week, I discovered that mice or moles had eaten off the green tops, leaving only an inch or two of top remaining. Will they continue to grow back, or should I dig them up and replant? 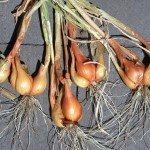 The tops will regrow as long as the bulbs are still healthy. You may, however, need to do something about the rodents, if indeed they are the problem.